Started the day off at Weight Watchers. 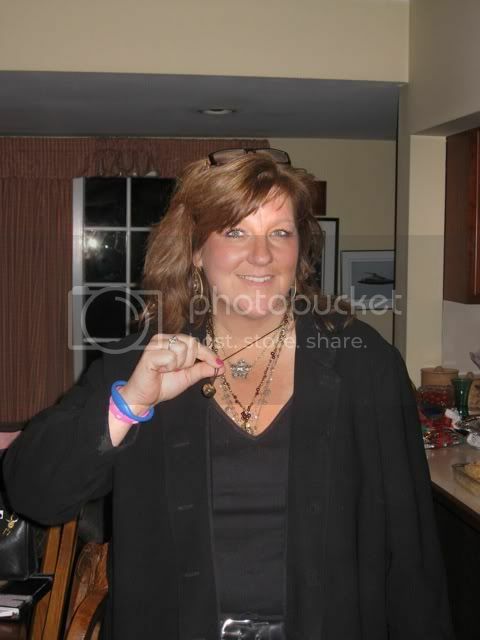 My friend, Lorraine, and I celebrated this morning as I lost 1.4 pounds and she lost 2 pounds. It’s always a better meeting when you are sitting there with some loss…I know it’s not suppose to be about the number, but it does have a lot of influence, unfortunately. However, last week was the first week that I could sit there with a bit of a gain and be ok with it, as I knew I did everything right the whole week, but the night before ww, went to a progressive dinner and drank 64 ounces of water throughout the night in order to stay on track with the food. So I was really proud of myself, and the water really helped, but I was drinking that water from 6-10:30pm, so I know it had to be water weight on the scale. But to truly be ok after a gain that morning was a huge step. Our leader, the people who weigh us in, and the entire group is filled with such special people. I wish everyone could experience a morning with these special people who are so honest and encouraging. We are all in this together, and you can just feel such a camaraderie in that room. They are all so excited for me as I leave on this trip, and I can’t wait to share with them next Saturday morning. I’m sure that I will be sharing so much of what they have all taught me with everyone this week. Anyway, after WW, I finished up some packing and organizing everything at home for my family while I am away. I also have been blessed with the greatest gifts while being away….. Lorraine set up meals to be delivered to my parents from her along with the church meals ministry, my brother is flying in from California to help with my parents, my husband is incredible and has everything under control with my house and my children…so all of this puts me at ease and allows me to go with a wonderful peace. This afternoon, to top it off, Lorraine also met me at a nail spa and treated me to a manicure/pedicure, with an extra 10 minute foot rub….absolute heaven! Another very special gift. I am so blessed. As I packed, my daughter took a few pictures of me in some of my new workout clothes, so that I could have the pictures for this journey. It was a really fun photo shoot, as she is taking photography in school, and she made me feel so great, she really is proud of me. So, there are lots of butterflies in my stomach, my bags are by the back door, the flight is very early in the morning. I am just praying that this week will just take my breathe away, and I will return with those 2 amazing words….only God! I’m praying that he uses everyone there, including me, to just touch lives in a mighty way. That He will bring me to a new level physically, mentally and spiritually. I just can’t wait to take in all of the wisdom and knowledge they all have to share. I don’t want it to go too fast, I know that this is another part of this journey that I am walking through, that is so much bigger than I am, or can even imagine. Very nervous, yet very excited…. ready to move forward and watch it all unfold….Can’t wait to share it with everyone! I’m Going to Boot Camp…. On September 23, which is only 9 days away from my writing this entry, I am going to be getting on a plane to Nashville, Tennessee, to go to my first boot camp/retreat. The really exciting part is that it is being lead by Carter Hays, Olivia Ward and Hannah Curlee (the sisters who won the Biggest Loser Season 11). If you watched, they were the first team to make it to the finals, and they were known as the “purple team”. On July 5th, Olivia and Hannah announced this weekend on their myfitspiration blog, and when I saw it, I told my husband that I would love to be able to go to that week. When I said it, I was just dreaming of the possibility. There was a place to tag it on facebook and “like” it, and underneath the tag I wrote, “I would love to go to this”. Well, within minutes there was another post that said….”you are going.” It was from my husband. He bought it for me for my birthday! (which was July 18). I couldn’t believe it! As I was dreaming and contemplating the possibilities, he just did it. (I guess it was meant to be, because it was sold out in 72 hours!…and he made sure I had a spot. 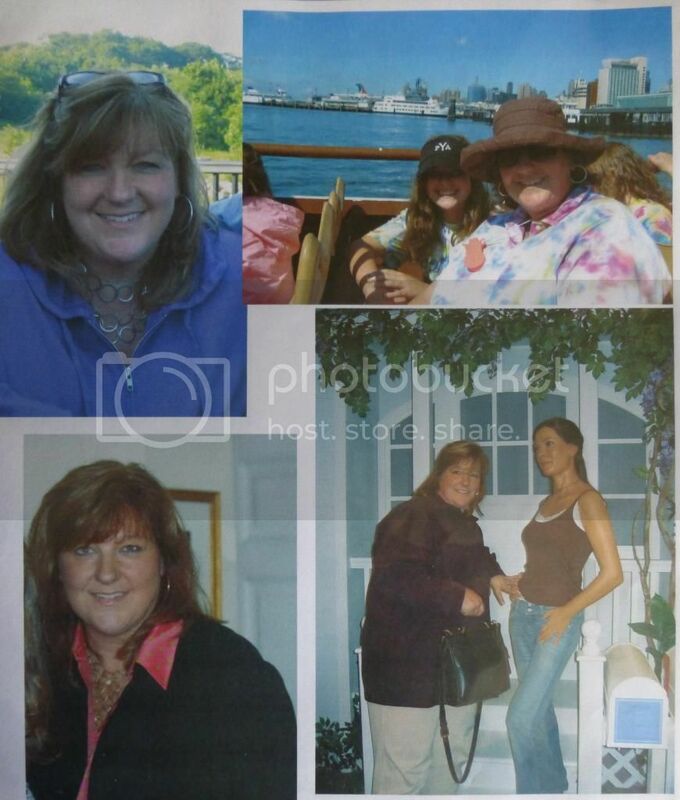 As most of you know, following my story, not only did I watch The Biggest Loser and get inspired by this amazing sister team, but Olivia actually wrote that powerful first email to me that began my whole weight loss journey, “It’s not that you have failed, you just don’t have the knowledge”. Then, shortly after she stood on that scale 129 pounds down, with confetti dropping and her hands straight up in the air with pure joy…she took the time to meet with me for breakfast, share so much of what she learned, and she inspired me, believing that I could do the same. So, these are some of the “celebrities and experts” that I am so blessed to be spending the week with. It will be a week where they all share everything they have learned…from exercise to nutrition to cooking to the spiritual and mental side of what it takes to finally win the battle with weight for good. I know that this week is going to be the most amazing gift, but, yes, there is a part of me that is petrified! As a woman, you can imagine all the things going through my mind at this point…will I be able to handle the work outs, will I be the last one if we are running or doing a challenge, will I be able to do it all, what will the other women be like who are going, what will I wear to work out in, what will I wear to hang out in, what will I wear to sleep in, what do I have to bring, do I have to bring/wear a bathing suit, do I have the right sneakers, can I last through the multiple workouts for the day???? ?…….and as the time gets closer, the questions continue. Getting ready, shopping and packing for this has been a job and experience in itself. I already shared the story of getting fitted for sneakers…but, wow, I have been using them at the track and in my workouts and… what a difference! I have also gone out a few times for some jeans and shirts and clothes to hang out in. Of course, shopping continues to take longer than usual, as I am in between sizes, I still start by taking in a load of clothes to the dressing room that are way too big, and different stores and designers run so differently in size. I have to get that out of my head at times, that just because the size is bigger in something, doesn’t mean I have gained weight back or increased in size. I am still losing and going down. I have bought larges, extra larges and even 1x in the same day, all because the cut is different. I needed this moment, because I have been stuck all summer at the 70 pound weight loss. I have really plateaued, and I’m doing everything I can to keep going. I have cried on the scale a few Saturday mornings at WW, because this is the first summer that I have stayed on a diet, exercised 5 times a week all summer long, and I truly thought I would have been another 5-10 pounds down. About 12 weeks ago, we filled out a post card at WW to ourselves, which we had to give back to the leader, knowing that it would be mailed to us Labor Day weekend. I remember being so fired up, going into the summer, believing that I could keep going for the first summer in my entire life. Other summers, I would either take a break for the summer, or would do something extreme for the summer to start, and then give up midway, promising myself that I would start when the kids went back to school and I would “get back on a schedule and lose the weight.” This was the first summer of my life that I hung in there the entire summer. I’m not saying that I was perfect. In fact, let me share with you something that I did that I hope I will never do again…In July, we were suppose to go away to California on our vacation, but with my mom and dad’s medical issues, I knew that I couldn’t leave. It was really hard to accept that we wouldn’t be going away on any family vacations this summer, which is something I hold onto…being able to just get away with my husband and children alone, even if it is not anywhere extravagant. It is a time to just be with one another on the same schedule, which gets harder and harder with all of their activities, jobs, etc. My brother decided to come in with his 2 children, so that we could at least together. the kids could be with their cousins, and he could help me with my parents. My brother has been one of my biggest supporters, so he was all ready to make sure we worked out every day. He even came to my gym for a class. During the week, I told him that one of my goals was to run the Turkey trot on Thanksgiving, which is a 5 mile run, so he even got me up on the track and showed me that I could already run a mile without stopping. That was pretty amazing to find out that I was able to do that. (a week later, after he left, I ran 2 miles with my daughter, and then ran 3 miles with my husband). Still working up to the 5 miles. In the meantime, during the week my brother was here, I made a big mistake and decided to relax, not count points or food for the week, and in our “vacation” mode, my brother made sure around 5 o’clock, cocktails were flowing. I haven’t done that in a long time, because the points and calories for alcohol have not been worth it, and of course while drinking, the chips and pretzels and dips arrive…not a smart place to put myself in. Well, although I didn’t go absolutely crazy with food and drinks, and we did exercise every day while he was here, when I got on the scale Friday night when he left, I was up 10 pounds in that one week!!! I couldn’t believe it. I thought maybe 2 or 3, but 10!…I was shocked and upset and just started to beat myself up. It took me weeks to lose 10 pounds, and here the scale was saying that I put 10 on in just one week. I knew that I would go to ww the next morning no matter what, but I chose not to weigh in. I wasn’t going to have a 10 pound gain in one week on my card. ( I did track it on my graph, though. I have to face it. I went to ww and got right on target that day, and a friend of mine who worked for ww said, don’t worry, it is not all “real” weight. You lost it slowly and the right way, you didn’t really gain 10 pounds in one week. That was easy for her to say. but I was stuck on that number from the night before. I wouldn’t have believed it, had I not lived through this one also, but Saturday night, after getting back on track for 1 day, drinking all my water, etc. I was already down 6 pounds! Thank God, she was right, it wasn’t all “real” weight. And i’m so thankful that I went to ww the very next day to get back on track. Years ago, I would have given up at that point for the summer, and promised myself to start after Labor Day when the kids went back to school. Not this time! That was the good news, but the tough news has been that I have been playing around with that last 4 for a few weeks now, and it is not gone for good, yet. I have been eating so clean, perfect weighing and measuring, and the scale is stuck. I have exercised 5 days a week, and even jogged at the track a few times, and it is just not moving. I have broken down in tears a few times on the scale, even handed my weekly food diary to the leaders at ww, who looked at it and said it is really perfect, the only thing they said to try is to flip breakfast and lunch to change it up a bit, but they keep promising that the scale will catch up. A few people asked if I had measured my body lately, so that I could see that I am losing inches and my body is still changing, which was great, because I hadn’t done that since April, for the Dr. Oz finale. It was great to see the loss in inches. It was a great discovery to see that my body is still changing in inches all over. So, the loss in inches, along with buying a size 12 pair of jeans, are my off scale victories for now, that I have to hold onto, as I am waiting for the scale to move. I also had blood work done and a saliva test to see if there is anything going on hormonally in my body. In the meantime, although I am petrified…I am also beyond excited,with great expectation of all that I am going to learn at this retreat/bootcamp. I will be spending the week with others who have gone through all that I am going through, and I am praying that all of their wisdom and knowledge will take me to a new level in this weight loss, fitness and health journey. Holding onto the promise that…, I can do ALL things through Christ who strengthens me. I will write as much as I can during the week, and I will try to post it each day so that I can share all that I am learning and experiencing that week. I know, based on all that I have been through, along with how this all unfolded, in somewhat of a “full circle moment”, that this is truly a “divine appointment”, and I can’t wait to see what the Lord has in store for all of us that week. Looking forward to sharing it with all of you. “O.K. Wend,-12 weeks until Labor Day!-Today you gained 1.8 pounds, because Dad is in rehab after his stroke, crazy week. You need a goal for summer to continue your amazing success. The summer will be crazy, but you CAN continue to do this! 3.) I will be in a new number. Because of that, I was able to celebrate what I wrote…I not only finished the rowing class, but our boat won the entire final race!…a night I will never forget. I worked out 5x’s a week most of the summer, and although I am at a plateau, I am in a new number. I actually kept this postcard to remind myself that I really made these goals during a very very difficult summer. It’s a nice feeling to be proud of myself, especially after getting a postcard that I thought was going to really be disappointing. So, I am excited to continue setting wonderful goals…and going to my first retreat/bootcamp in the coming week is going to be a week filled with incredible goals to accomplish! In September, I will be going to a fitness retreat entitled “Unleash Your Champion”, which is going to be lead by Carter Hays, along with Olivia Ward (winner of the Biggest Loser), her sister, Hannah and some other amazing inspirational people who will be sharing all that they have learned with us, from fitness to nutrition, etc. I am both excited and petrified to go. One of the things I know that I will need are great sneakers. I emailed Carter to ask him what he recommended, and he told me that he really liked New Balance, and suggested that I go to a place that really fits me the right way. I kept this in the back of my mind, and knew that it would be on my “to do” list as I got closer to the retreat, but then the other night we ended up having dinner in a place that was actually next door to a New Balance store. After dinner, I walked over to check out the store. 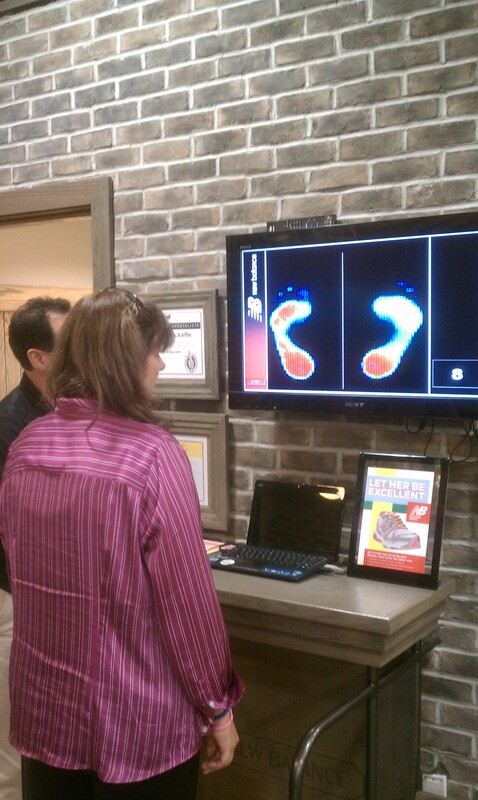 When I walked in, I noticed right away that they had one of “those fancy foot measuring machines” on the far back wall. I stopped as I walked in and saw the machine. On one hand, I was excited that I was actually in a New Balance store that had the machine to measure me, on the other hand, as I saw the big flat screen TV on the wall over the foot machine on the floor, my very first thought was….does my weight come up on that screen? Do they have to know my weight in order to fit me for sneakers? (those tough times of being measured for skis went through my mind, where you have to give your weight in order to rent or buy skis). As all of this was going through my mind, and I was already thinking of heading for the door, a salesman walked up to me and asked if he could help me. I hesitated as my eyes were fixed on that TV on the wall, and then I explained that I had never been properly fitted for sneakers, I was headed to a week of “boot camp”, and I needed great sneakers that would be comfortable for working out. “However,” I said to him, “can I ask you a question?”, will my weight come up on that machine, or do you have to know my weight in order for me to be fitted for sneakers?” When he answered, “absolutely not”, my whole body relaxed in relief. I know it may sound like the stupidest thing ever, but that is what I was concerned about, and pretty much willing to walk out if they needed that information. Once I could relax, he asked me if I had any problems with my feet, what kind of exercise I was doing, etc…I was able to share with him that I have a lot of pain in my right foot due to a Mortons Neuroma, and he said he had the same thing and completely understood. With all of the measurements he took, along with listening to my exercise regimen, he brought out 3 boxes. He knew from the beginning which ones I would end up with, but he let me make the decision. He also placed special inserts in, which he cut specifically to alleviate the pressure on my neuroma. He was so knowledgable and so kind and so patient. My husband and daughter were with me and helped me make the decision. 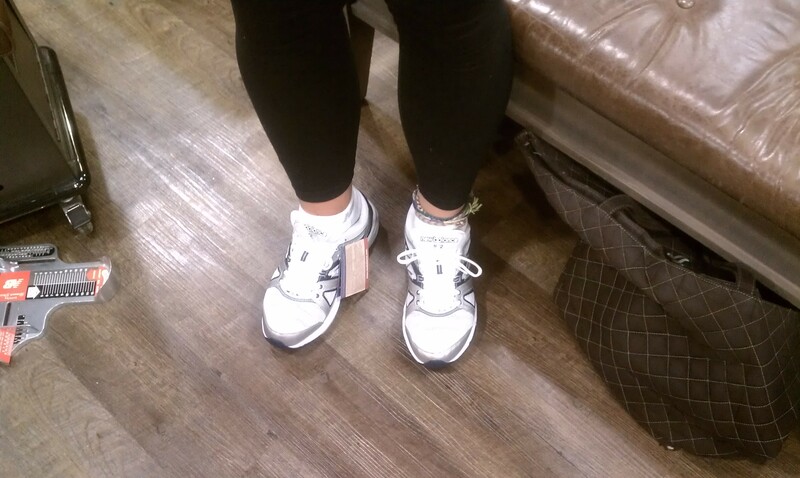 I actually had my husband take pictures to document another “first”…mainly because I wanted to write and share with all the other women who are apprehensive about walking in a store and being fitted for sneakers. As the salesman rang me up, I had the chance to thank him so much for making it such a nice experience. I shared a little bit with him about just losing 70 pounds, and told him a little bit about the Dr. Oz challenge. Then I was really honest and told him all that I was thinking when I walked through those doors that evening. He had no idea that someone would worry about their weight being on the machine, or for someone to be a bit nervous to go through the whole fitting process. I told him how much it meant to me that he walked over to me right away as I was standing there, and in such a kind way, put me at ease, and made the whole process easy and enjoyable, and believe it or not, special for me. It was another ‘first’, and just as I felt months ago walking into the gym…walking into a fancy sneaker store was a bit intimidating…it’s one of “those” stores for ‘”real athletes”. And he went on to assure me this store was for anyone who needed great sneakers to keep you comfortable and fit you the right way to that you can do what you want to do, and that he really loved being able to help people find exactly what they needed. We exchanged our business cards, as he wanted to read about my story, and I told him I might even be back to buy some running shoes one day….who knows? For now, I walked out with comfortable sneakers which were cross fit shoes to handle the different work outs I am doing, along with started to jog a bit. I told him that one of my next goals was to jog the “Turkey Trot” on Thanksgiving, which is 5 miles, so he made sure my sneakers would be great for that also. The next night, which was the night of the finale of the 2012 summer Olympics, my daughter and I went up to the track, and we jogged 4 times around..1 mile….without stopping. My brother believed that I could do it, and just kept telling me to just do it…so we did! It was another unbelievable achievement..Grace and I high fived at the finish line, and went home to watch the Olympics, feeling ourselves like awesome athletes…I guess I did belong in that store!! !….and…my feet felt great! I can check sneakers off of my packing list….ready to go and learn how to “Unleash my inner Champion”. Me on the foot analyzer.